Today marks the end of Water Saving Week but we hope for most of you it’s just the start of a lifetime commitment to use water more wisely – and encourage others to do the same! If you’ve been following the campaign over the last week you should have soaked up lots of good reasons for all of us to value this precious resource and not take it for granted. There is no escaping the fact that our growing population and changing climate are turning up the pressure on our water resources. If we do nothing to address this challenge, by 2050 demand could outstrip our supply of water in the UK by more than 20 per cent. Water companies need to plan and invest in making our supplies more resilient. But we can all play a part too by using water wisely wherever we are, whatever we are doing. Today we’re asking you to turn a ripple of interest into a wave of action by making one simple pledge that will help to save water; and encourage at least one other person in your friend or family group to do the same. Small actions really can make a big difference to our water resources – but there’s another good reason to save water too. A growing number of us pay for the water we use through a meter which means we can ease the pressure on our wallets too. Metered households tend to use less water than those of us who still pay fixed charges. In fact some households are surprised to find they can save more than £100 a year when they switch to a meter. If you’re nervous about switching there’s a simple way to test the water – use our free and easy-to-use water meter calculator. It will you give a good idea whether you are likely to be better off before you take the plunge. We’ve come up with six pledges for you to choose from which can help you and your community save water and, in many cases, money too. 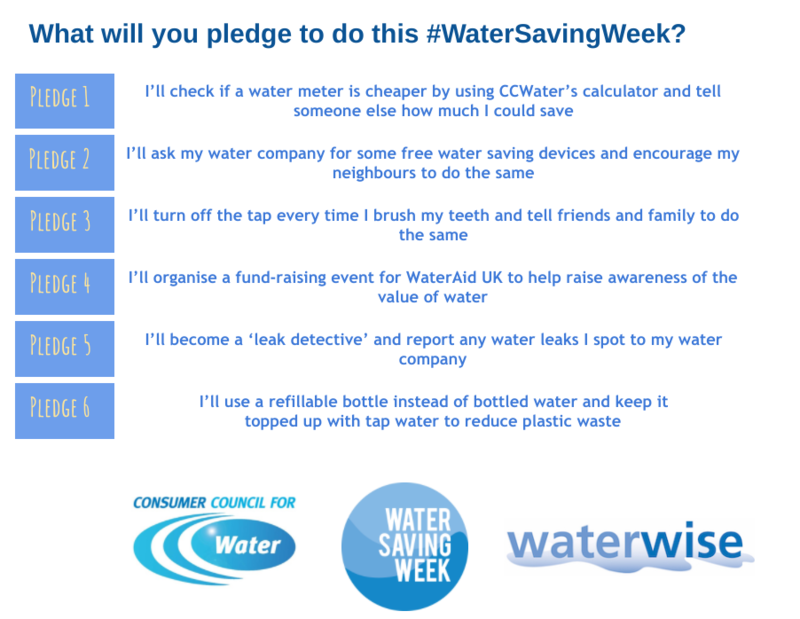 I pledge to check if a water meter’s cheaper by using CCWater’s calculator and tell someone else how much I could save. I pledge to ask my water company for some free water saving devices and encourage my neighbours to do the same. I pledge to turn off the tap every time I brush my teeth and tell friends and family to do the same. I pledge to organise a fund-raising event for Water Aid UK to help raise awareness of the value of water. I pledge to become a ‘leak detective’ and report any water leaks I spot to my water company. I pledge to use a refillable bottle instead of bottled water and keep it topped up with tap water to reduce plastic waste.